Although the World Heritage listed Marine Park of the Great Barrier Reef is the region's top attraction, there is also so much to see and do in the surrounding areas. From island hopping and fishing to snorkelling, scuba diving and glass bottom boat rides there's a fun way for you to get up close and personal with the marine life of the Great Barrier Reef. Depending on where you choose to stay, there are also a great range of local area attractions to explore and enjoy including the famous Daintree Rainforest - the only place in the world where the rainforest meets the reef. Night Markets: Held nightly on the Esplanade, the Cairn's night markets are an institution and are ideal for discovering an incredible world of arts, craft and true blue Australian souvenirs. Flecker Botanic Gardens: Afternoon tea at the Gardens with freshly baked scones and lashings of cream will linger in your memory. Reef Hotel Casino: The spectacular conservatory atrium presents international class entertainment nightly. The Pier Marketplace: A leisure retail centre that features Undersea World, a reef aquarium and the Marlin Marina. The Pier is also home to the weekend 'Mud Markets'. Paradise Palms Golf Course: Opposite Kewarra Beach, this world renowned championship course boasts one of the most striking clubhouses anywhere. Wild World: The Tropical Zoo: Cuddle a koala, pat a wombat, feed a kangaroo, stroke a snake or watch an incomparable cane toad race. Outback Opal Mine: See how dazzling opals are first uncovered deep underground in a mining documentary then walk through an opal mine replica. Sunday Market: Each Sunday morning at Anzac Park, these colourful seaside markets offer something for everyone. Four Mile Beach: Here firm white sand provides a playground for families, a base for beach carnivals, festivals and photo opportunities. Mossman Sugar Mill: The mill hums its way through the sugar cane harvesting season when it is possible to take a guided tour of the entire process inside the mill. 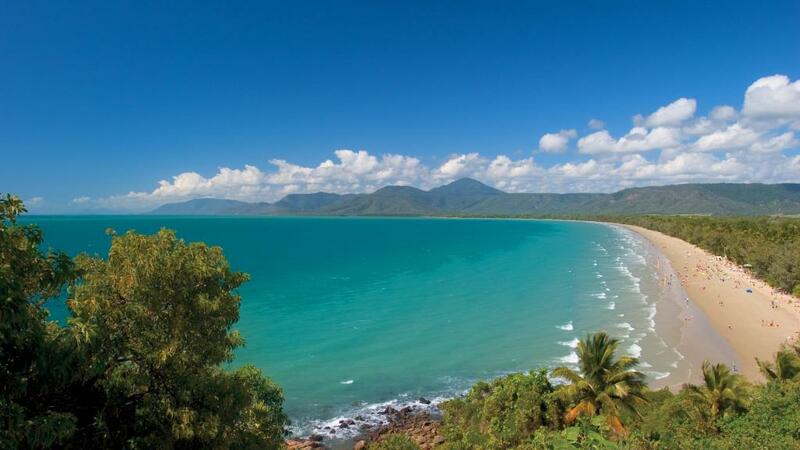 Flagstaff Hill: The best place to capture the striking views of the town and its superb Four Mile Beach. The Reef Marina: Enjoy a tropical drink as the sun goes down over Dickson's Inlet and watch the tour boats return. Black Mountain: Named by the local indigenous people 'Place of Spears' the mysterious pyramid of stones is a natural geological formation thought to be 150 million years old. James Cook Museum: Featuring the original anchor and a cannon from the'Endeavour'. Bicentennial Park: Home to the re-enactment of Captain Cook's landing which takes place during the Discovery Festival held each Queen's Birthday weekend in June. Grassy Hill: One of the most popular walking trails because of its 360 degree views. Aboriginal Rock: Located in the Laura River Valley, explore the 32,000 year old Quinkan Aboriginal Rock Art sites. Lion's Den Outback Pub: A tenacious survivor of the frontier days of the late 1880's. Birdworld Kuranda: Home of the giant cassowary (2m tall) and the largest collection of free flying birds. Handfeeding and photo opportunities. Mareeba Heritage Museum: Enjoy a fascinating glimpse into northern pioneering life with many unique displays. Australian Butterfly Sanctuary: A spectacular, live butterfly exhibition in Kuranda, with hundreds of colourful tropical butterflies flying through an all-weather rainforest environment. Kuranda Heritage Markets: Wander through the beautiful rainforest setting and watch artists at work. Ninety stalls provide an innovative range of handmade local crafts plus Australian opals, gemstones, crocodile and kangaroo leather goods. Atherton: Located in the centre of the Tablelands, Atherton has a historic steam train journey, restored chinese temple and one of the best mineralogical museums in Australia, the Crystal Caves. Yungaburra: This heritage listed village is famous for its fine restaurants, heritage buildings, festivals, arts and crafts and monthly markets. Malanda: The environmental centre features a volcanic display and is near Malanda Falls, a natural swimming pool with waterfall and environmental walk. Millaa Millaa: Famous for the Waterfall Circuit, where three waterfalls comprise a stunning environmental tour safe for swimming. O'Briens Creek Gemfields: Located at Mount Surprise, dig your own topaz stone and have it faceted or search for gold near Forsayth and Georgetown. Croydon: Features the Working Mine Museum with its restored gold milling stamper, and for train buffs an original A10 Steam Engine. Undara Experience: Voted best unique accommodation in Australia, visit the Undara Lava Tubes or relax and enjoy genuine outback hospitality.